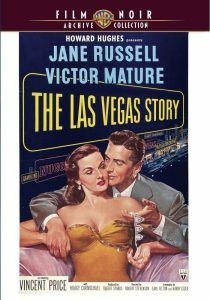 ﻿ Jane Russell and Victor Mature play it as it lays in this hardboiled thriller costarring Vincent Price. Linda Rollins’ (Russell) luck has gone from bad to worse. A casino owner’s been bumped off, her diamond necklace is missing and her shady husband (Price) is suspected of the crimes. So when her bitter ex-flame, police lieutenant Dave Andrews (Mature), takes charge of the case, all bets are off when the killer kidnaps Linda and threatens to cash in all her chips. Originally set in Miami, the movie’s locale was changed to Las Vegas when RKO studio chief Howard Hughes decided to publicize the city in which he’d recently taken a financial interest. Highlighted by one of the earliest helicopter/car chases ever filmed, The Las Vegas Story also features three songs by costar Hoagy Carmichael: “The Monkey Song,” “My Resistance Is Low” and “I Get Along Without You Very Well,” the latter two performed with Jane Russell.